I love most orchids, but the one of the types that I love the most are the Catasetum Alliance plants. I've seen more interest here on this forum lately, and a lot of questions about them, so I thought I would put together how I grow them. If this helps someone who is wary to try them and encourages them, or helps someone who is having trouble with them, then I thought it would be worth it. Please keep in mind, this is how I grow them, in my conditions, and the observations I've made while growing them. I was not always successful with them, and lost many of them my first couple years of growing them. I am still learning more about them, and I have found some types are much easier for me than others. There is never only one way to grow an orchid, so please if you have anything to add, or disagree with anything I've written, please jump in. Most Catasetum Alliance plants begin the growing season in early to late spring. At the base of an existing p’bulb, a tiny little green growth will appear (or more). Sometimes this growth will start higher on an existing bulb. This can be due to a few reasons, but usually if the base is damaged, a growth can/will start higher on the existing bulb. At this time the plant should still not be watered. I wait until the roots have reached down into the medium, about 2 – 3 inches long AND the new leaf tips have separated before beginning watering. Then I wait another week or two before beginning fertilizing. Once active growth begins, the new growth will grow extremely quickly. During this time, the plant needs lots of water, fertilizer, sun and warmth to support this growth. But I do like them to dry out a little in between watering. I have also noticed my plants do much better when I pot them higher. In other words, the base of the p’bulbs is just a little higher than the top of the media. I like to say wet feet, dry butts. Repotting (if needed) should be done just as the plant begins to need watering. 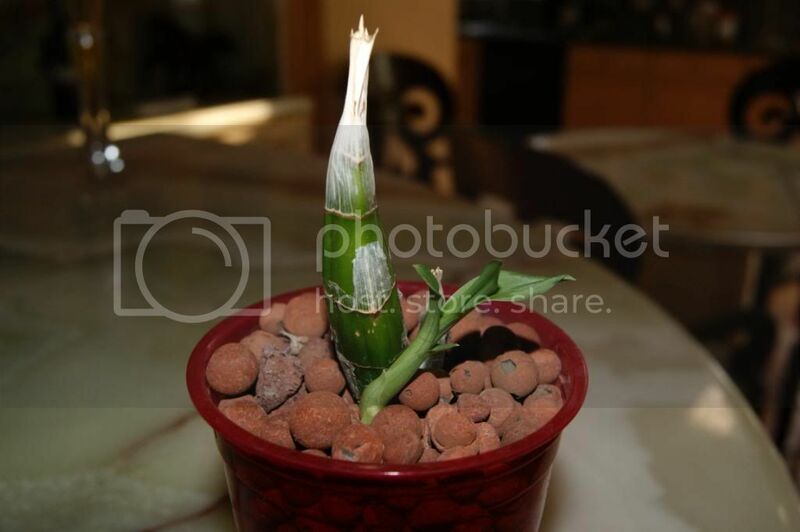 Catasetum’s roots are extremely brittle, and if they get too long, it is very easy to break them. You could repot during dormancy, but in order to do so, the process of wetting down the roots, and then continued wetness may cause the plant to rot if it is still dormant. I do try to keep as many of the old roots as possible when repotting, although some people just remove all old roots, and plants do seem to be able to handle this just fine. Tiny little nub just starting after a long dormancy. It's right below the base of the old flower spike. and bigger, with roots starting - But still I'm not ready to water yet! FYI - these are different plants, but hopefully show how they start. royalkat, denite25, Sus and 1 others like this. Last edited by rcb; 02-05-2010 at 12:29 PM. After the new p’bulb has reached maturity, most plants will enter a dormant period. This period can vary drastically depending on the genetics of the plant. Some will actually start a new growth before completely dropping the previous growths’ leaves. The dormant period can be as little as a week or as long as 4+ months, again depending on the plant and conditions. There are various opinions on watering during dormancy. Some say not to water at all. Some say to only water if the p’bulbs are severely shriveling. A very few people say to water normally, but these people usually depot them so the roots dry within a few hours. Personally, I water if I see severe shriveling, but I bottom water them, so there is no wetness around the base of the dormant bulbs. 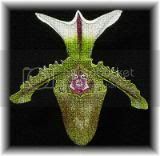 Dividing – Many people divide their Catasetum alliance plants often, and sometimes down to just one bulb. And they have do have success with this practice. I personally do not like to do this. As with most orchids, I think a bigger plant will flower better. So I only divide for three reasons. The first, if I want to give a piece of the plant to someone else. And second, sometimes, when a plant has more than one new growth a year, the middle of the plant becomes the oldest bulbs and kind of naturally separates into two or more plants. And third, sometimes the plant just gets too big to handle. When I divide a plant, I try to have at least two robust b’bulbs attached. My reasoning is the plant will go on to flower more quickly if you give it enough resources to do so. I’ve found dividing is most successful if it is done during the plant’s dormant period. When these plants are divided, I’ve found a very high success rate with having the b’bulbs start a new growth. Sometimes this can take a little while, but I’ve only had three plants in all these years not go on to start a new growth (and one of them was a single b’bulb). And this takes us to b’bulbs. It is not unusual for a Catasetum alliance plant, during dormancy or during the initial new growth phase to “eat up” a b’bulb. If you are not used to seeing this it looks like your plant is rotting. It is not. The old b’bulbs will become yellowish/brownish and become soft. This is not unusual and does not spread like rot does. It is also not black and smelly like rot is. If your b’bulb is dark brown, black or smelly it is rot. 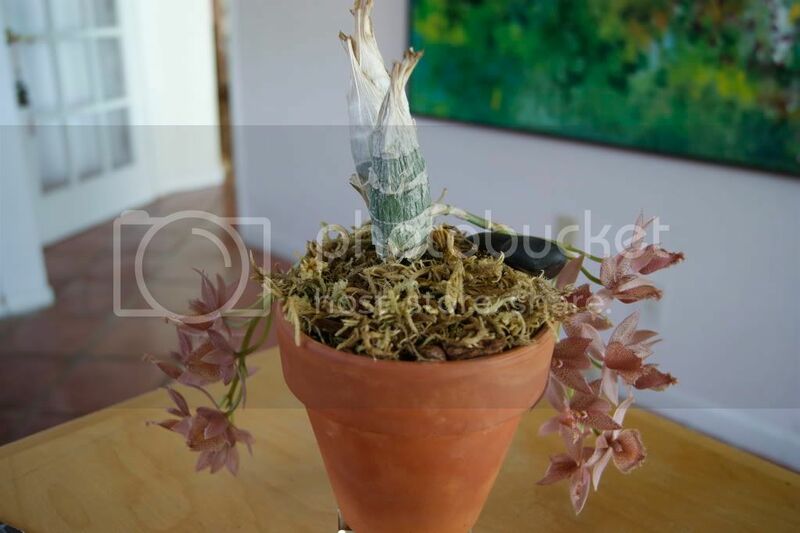 The yellowing b’bulb will eventually completely dry up on its own and can be removed while repotting. But I will add, this is not usual if it is the previous season’s b’bulbs, and you are down to only the newest ones. My b’bulbs typically last/stay green for at least 3 seasons. In general, if your b’bulbs are doing this after only one season, then your plant needs something it is not getting. 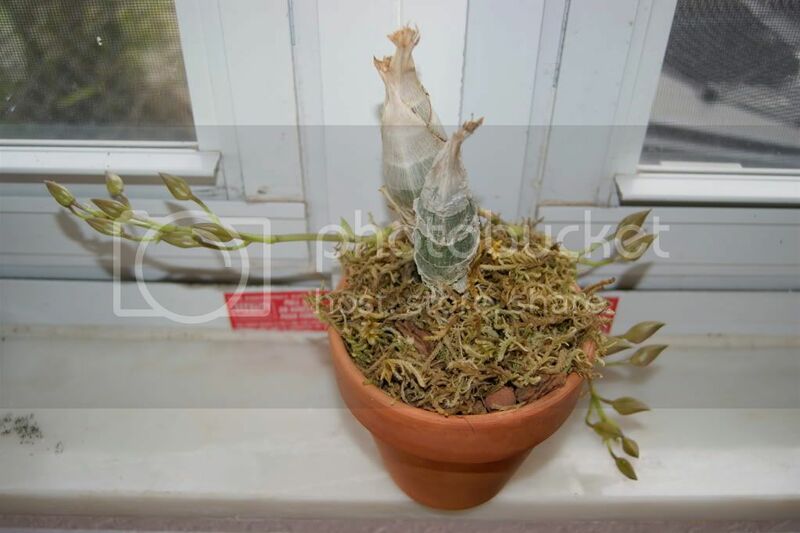 Pics of same plant from two sides, showing old b'bulbs beginning to shrivel - this is OK.
ok that's the general cycle, again please jump in if you have something to add, or if you disagree with something I've written. And if you have any questions, or clarifications, please jump in. If you all find this helpful, I'll go into more details later on about the differences I've noticed over the past few years of the different genera and their different habits and requirement. Last edited by rcb; 02-05-2010 at 12:33 PM. Thanks Renee for the detailed information you've posted, I appreciate it. This is my first year growing these types of orchids, and it's all so new to me! These alliances are from varied natural growing conditions. I was always told, to be safe keep them above 60F winter lows. That they may grow if they are kept below that level, but they won't flower well. And for the most part I have done so. But last winter, they accidentally got down into the low 40s (F) for a couple nights, and they didn't die. And if fact, my best flowering year ever was last summer. So I won't go so far to say that you can keep them colder than 60F (in the winter), but I am experimenting with b'bulbs this winter, keeping them at a consistent winter low of 50F. Time will tell if this hurts them, or if it has no effect on them. I also should probably mention that these plants really really attract spider mites. Have to be diligent about checking for them. And found out last summer slugs consider Ctsm spikes to be the supreme delicacy. But on the plus side, I've never seen scale, mealybugs or aphids growing on these plants, even if they were on other orchids right beside them. Very helpful Renee. How much light to they want? And what type of medium do you use? I give them as much light as I can, they sit next to the Vandas. They probably do not need this much light though. The new growths can be a little more tender, and I'll have them shaded until they start to really take off with growth. As for the medium, I typically use spaghnum moss/perlite in net pots that I hang. This year I'm experimenting with CHC in regular pots as well. 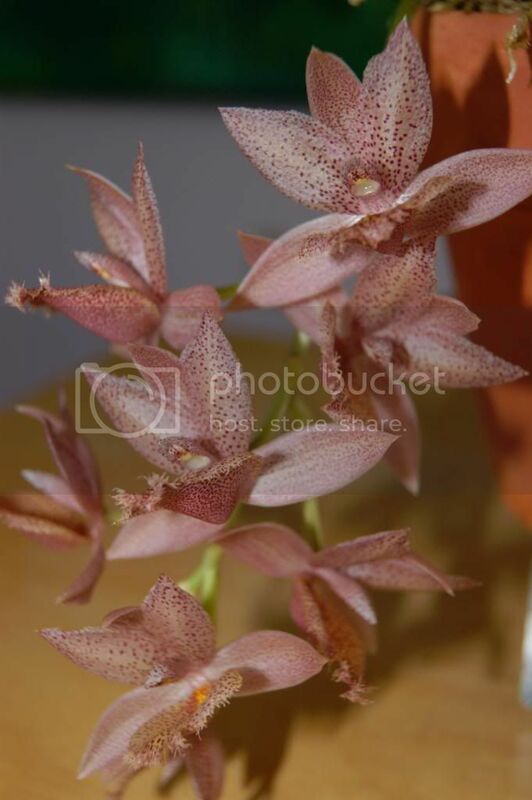 But they will grow well in any standard orchid mix that retains some water, and has good drainage. As for S/H, I've never tried it with these, but Jay has done well with it. Many people grow these in baskets as well. I have seedling from this family and I know next winter I will be searching for this post. Can this be made a sticky? Thanks Renee for the tutorial. Thanks so much for all this, Renee! When I was trying to decide if I should order one of Jay's little 'chids, ( I did!) , I read all the After Dark threads and cut-and-pasted all the good advice into a separate document for my own reference. This is much more organized and will be invaluable. I echo the request for a sticky. Great advice, and good photos, thanks for the tutorial.The time you spent is much appreciated. This is great! I agree with Brooke, and will stickify it! I also am curious about the blooming. My Cycnoches cooperi 'SVO lll' FCC/AOS x Cycnoches Jean E. Monnier '#2' blooms from up high on the bulb. I have a Ctsm. Jumbo Prime 'Elk Grove' that hasn't bloomed. There are 3 healthy fat bulbs, but no bloom. It had good light~ I also have read that they bloom from the bottom of the bulb. Is this what you've found? This is a great tutoral, thanks for taking the time to share it with us. I am gonna get a catasetum or two to try with. My Cycnoches cooperi 'SVO lll' FCC/AOS x Cycnoches Jean E. Monnier '#2' blooms from up high on the bulb. I have a Ctsm. Jumbo Prime 'Elk Grove' that hasn't bloomed. There are 3 healthy fat bulbs, but no bloom. It had good light~ I also have read that they bloom from the bottom of the bulb. Is this what you've found? I have the blooming habits, and other genera specific growing habits I've noticed of the different genera mostly written now, just have to touch it up. The questions you asked will be included, but for now, yes, you are correct. Also, I wanted to include pics for this section, but waiting on a part for my laptop (which will hopefully fix it), been using hubbys the last week. All my pics are on my hard drive, not backed up of course. If all goes well, and the part arrives today, and works, I'll be able to add the rest of the sections with pics tomorrow. If it doesn't work, I'll just add the written part, and follow up with pics when I get access to them. The pics already posted are ones I've taken this week. Thanks Renee, you are the ultimate enabler! ok still can't acces my pics so I'll put these parts in, and upload pics when I get them. Catasetums (Ctsm) Flowering time for the majority of available Ctsm species and hybrids is during the peak of the growing season, into very early dormancy. Commonly available exceptions are tenebrosum and denticulatum. Ctsm can flower male, female or hermaphroditic depending on the growing conditions. Can even get different types of flowers on the same spike. Spikes can be erect, erect and arching, erect then descending, and descending, and from the bottom third of the new p’bulb, although the majority of mine start at the actual base. Female flowers are typically non-resupinate, green, and the lip is hooded, and many female flowers look a lot alike, no matter the species. Male flowers are either resupinate or non-resupinate, and a very wide variety of shapes and colors. Hermaphroditic can be anywhere in between, and these are usually sterile. Male flowers typically last about a week, and female flowers for a couple weeks. Also, there are usually many more male flowers on a spike than female. Mine rarely need watering during dormancy, and usually if one does, it’s either still young or is struggling. A fascinating trait (at least to me) is the antenna on many male columns. If something touches the antenna, the flower will shoot the pollen out at up to 10ft (300 cm) per second (Holst, 1999). Here is a link to many Ctsm flowers. Clowesias (Cl) Flowering time for many of them is after dormancy has begun. Clowesias flower perfect flowers and this trait carries into their hybrids with Ctsm. Many Clowesias spike’s are descending and from the base of the new p’bulb. All of mine behave this way. My Clowesias tend to have very long dormant periods, and do not seem to need much water to carry them through it, even when flowering. Flowers can last longer than Catasetums from a week up to almost a month. When hybridized with Catasetum though, the flowering time is shortened. I find the Clowesias and Clowesia/Catasetum hybrids the easiest to grow for me. I’ve also noticed the Clowesias need the most light to bloom well. Cycnoches (Cyc) Flowering time is from the peak of the growing season into early dormancy. Spikes are from the upper part of the p’bulb, initially erect, then arching down. Cyc flower male or female. My male flowers are non-resupinate. (I’ve never seen a female one). My flowers typically last 10 days to two weeks. I’ve noticed the Cyc that I have, typically have a relatively short dormancy if they have any at all. I’ve also noticed that Cyc p’bulbs tend to shrivel more than Ctsm and Cl during dormancy, so mine typically get a light bottom watering every so often. But it is not on a set schedule, I look at the plant, and determine if shriveling is getting too much, and if yes, then do the bottom water. My Cyc seem to do very well in less light than the Ctsm and Cl. Catt level type light seems to work well for these for me. Mormodes (Morm). Flowering time is typically from the end of the growing season through dormancy. Spikes typically erect (at least mine are) or erect then arching from the weight of the blooms, and from the bottom half of the new p’bulb, but usually not the actual base. Flowers typically last about two weeks or a little longer. I’ve also noticed new growths on these guys can come from above the base of the previous p’bulb more often than the other types. I’m not sure if that is due to their natural habit, or because I’m still struggling to grow these ones, and I’m damaging the bases. Of all the types I grow, the Morm do seem to need more watering during the dormant period than the others, and again I bottom water if the plant looks like it needs it, especially if flowering while leafless. One interesting trait of Mormodes is the column is twisted to the side. Morm, like the Cyc, seem to do better with less light than the Ctsm and Cl but still need bright light. I find these the most difficult for me, and am continuing to search out more info, and experiment to become better at growing these. Hybrids – in recent years, there has been a lot of intergeneric hybridizing with this Alliance, leading to beautiful and not so beautiful, but interesting flowers. These hybrids can display a variety of habits from their various parents. For example, I have a Clowesia/Mormodes hybrid, that flowers well into the dormant season (Clowesia), the spike comes from the lower part of the p’bulb, but not the base (Mormodes) and starts erect, then descends (Mormodes and Clowesia combined). The shape of the flower is more rounded with a straight column (Clowesia) but very brightly colored (Mormodes). The dormant period is longer than Morm, but not as long as Cl. I'll finish this with these reminders. In order to grow your plant well, look at it, and listen to it. Are the previous years bulbs bigger than the new ones? Then it needs more light/water/fertilizer. Remember bigger does not necessarily mean taller, some of mine grow fatter not taller. Are all your roots dying over the dormancy? Maybe it needs just a touch more watering in the dormant period. Are your b’bulbs shriveling too quickly? Then again, try a touch more water during the dormant period. And if it is growing well and blooming well, then it likes what you are doing, and don't change anything and post pics please, I really would love to see them! Renee this has been extremely helpful! Thank you so much for taking the time to put this all together in one informative and easy to understand posting. I've semi-struggled w/my 2 plants (1 cycnoches and 1 cycnodes) but now I see better flowerings in my future!! Thanks!! Thank you for the helpful info. One of my catasetums is just starting new growth and will need to be repotted to stay in the pot. great pics! thanks and good growing! My Catasetum alliance plants are starting to really take off with the growth, so I thought I'd take a couple pics to show what they look like. The first pic shows how long the roots are before I start watering. But I also want to point out the plant on the right. You can see it's the biggest growth, but it doesn't have it's own roots yet. I'm not watering this plant yet - even though the new growth is so big. I've added a close up (third pic) showing it just has the beginning of root stubs. Renee, this post is awesome! You've done a great job sharing so much information. Now, I feel better about the few that I have! I know more what to do with them! And, I see some things already that I need to change! WOW, those are growing great. My leaf is still a nub. I have three coming today from Fred C.
Leathal, don't worry if yours is still a nub, I still have a few that haven't even started anything yet. As you get more, you will see that they all do their own thing in their own time. Some show the little nub and within a couple weeks they are huge. Some are so slow, it drives you nuts. And congrats on your newcoming ones. I've bought a few from him myself. Danelandy, glad this info has helped. As you know, I love these, and if I can help others with them, then it was worthwhile. Renee thank you for all the info. It's really great! I have couple of questions what happen if I water them early? Did you keep them in the same spot while they are active and dormant? ysanabria - if you water them too early - you greatly increase the odds of the new growth rotting, and the rot spreading to the old bulbs. There are no absolute rules, so it is possible someone has accidentally watered one, and it survived, but it's not a good habit. As for the same spot - I wish I could. When I had my greenhouse, they were at the top, and I left them in place during fall,winter,spring. Since they were at the top, it was easy to avoid watering them. But I still moved them outside for the summer. Now, I actually have a box where they are stored when dormant, then a spot where they go when they wake up (in front of my best windows), and once the nights get warm enough, they will go outside, if they are ready for watering. (My outside spot gets rain). Thank you!! I want to water them so badddddd!! I wont now!! Last year they grow so much faster, this year nothing... yet!! Do they always get new bulbs? Here is one in flower right now, it has been in flower over two weeks now! Sorry for the pics in web format but i still dont know how to post them in big size! Yasanabria - Not only is that a gorgeous example of this alliance, it is also a perfect example of a Clowesia x Mormodes cross, where it came out exactly in between the two. Rene how often do you water them when they are in spike and flower? That is a GORGEOUS! I really need to add a few more of these to my collection. Ysanabria - It depends. If they are flowering while they still have leaves, then normal watering. If they are flowering without leaves - like yours is - then I don't, unless the p'bulbs are shriveling excessively. If they are shriveling, then I'll bottom water them. By bottom watering, I mean I'll set the plant in a bowl with a little water in it, and let it soak the water up. But even with this, it is not very often. what happens if I water them early? Ysanbarra, most Catasetinae roots grow in anticipation of rain, even in nature. They are genetically programmed to sprout a few weeks before the rain starts. So, if you start watering them early you are deviating from what their natural programming says they need. It may rot the plant or inhibit/lessen flowering. Leathal - Actually the first pic that one is getting close, really it is, another week maybe? Second one ABSOLUtely not! lol Third one not yet either. Remember, roots, and leaf tips separating. Want to also mention they look really really good, from what I can see of the b'bulbs they are looking perfect as well. I wanted to add an update on how mine are doing this year. The majority of them have started new growths by now (end of March). Some are growing very fast, and some are slower. About a third of them are big enough, and roots are long enough that they are being watered regularly. Two have even started spiking this early. Both of them are pure Ctsm hybrids, which can bloom earlier than the other types from this alliance. - Although it is still really early for spiking. I should be able to move them outside in the next couple weeks, and then they will really take off. For those of you who's plants have not started yet - don't worry. I still have a couple that haven't started either. They will when they are ready. I now have two that I am going to start watering. Leaves are separated and are about 2 inches tall now. Lots of roots. Dang, my brain can't retain all of this. Thanks YSanabria for bringing this forward again. I've refreshed my "memory." I broke the golden rule and have hit them with some water. Maybe I can still avert a problem. Renee, I held off on potting the two you said to wait. I just potted them the other day and they are sitting in a bark mix with some coco chips mixed in. I'll leave them be. The other two were potted a few days after I received them and the little growth meets the separated leaves and good roots stage I believe. The other is showing a tiny little growth starting. But it has gotten some water. I'll stop. How do you keep them steady? A pot clip does not seem the right choice. I've got one propped up with a small rock. I guess the good news is that two are showing growth and the the other two aren't shriveled up dead. I'm am still feeling optimistic about my new venture into this species. I will keep you posted. Ysanabria - I can't tell how long the roots are but the growth looks good. As long as the roots are at least a couple inches long, then yes, go ahead and start watering. Lynne, If they don't have roots from last year to hold them up in the pot - and I can't remember if yours do - then I use a BBQ stake to steady them until the new roots are extensive enough to hold them. As for watering too early, as long as they aren't rotten, then you are still fine. I'm glad you've got growth, the one I divided to send you, all of my pieces i have left are now showing growth as well. Good idea. Skewers it is. Thanks. WOW!! Renee that sure is alot of great information. I usually start watering as soon as I see some growth on my Cycnoches, I've not had a problem but maybe just lucky. I have this Cyc. Jean E. Monnier that is just starting and there is a second growth up above not sure what to do with it, I will not water any more until the roots are larger. My other Cyc. is Cyc. loddigesii it is off to a good start has a spike already. Thanks...... Jim. Last edited by jim blanford; 04-16-2010 at 11:29 PM. Jim...I didn't know they could spike already. Is it a certain one that does that? I need to take some more pics of mine. Jim they look great - yeah the one that has the second nub high, I have a few, usually Mormodes or Cycs that do that once in a while too. When I have had this happen, it's usually only a nub at the top, and I lay the old p'bulb so that it's roots don't have that far to get to the media, but you've got one at the bottom as well, no idea what to do for that, maybe try laying the old bulb on it's side so they can both reach the media? And yes, Cycs can be a little more tolerant of early watering, I've found that as well. congrats on the spike! I only have two that have spiked so far this season. Leathal, his plant is already far along in the growing, and it looks about the right size for the Cyc to start spiking. Last edited by rcb; 04-17-2010 at 07:17 AM. Last edited by zaeem; 05-13-2010 at 08:12 AM. Reason: attachement in gallery. Zaeem, sorry I missed your previous posts. As for 5 years but no flowers - the plant looks like it is big enough to flower, it also looks very very healthy. I really don't have an idea as to why it hasn't flowered yet. As it as Grace Dunn in it, which is a Clowesia, maybe try giving it a little bit more light if you can? Do you grow and flower Vandas? If so, try giving it the same amount of light as you would them. Increasing the light gradually so you don't burn the leaves. Zaeem, the leaves are supposed to drop off each year - that is fine. I would definitely try to increase the amount of light you are giving it, but again gradually so as to not burn the leaves. My Catasetum type plants right now are getting full direct sun from sunrise to about 3pm. A lot of light. I live in Florida in the US, and our sun does get pretty hot, these types of plants seem to thrive on that. Also remember as you increase the amount of light, the amount of water and fertilizer the plant needs will increase as well. I did a quick search on the climate in Karachi - and from what I could tell it seems like it is perfect for Catasetums. So I would say, a little more light, and a lot of patience. Good Luck! Thanks again,I will expose it to more sun in the morning. Please let me know,how I can grow Vandas?I have failed!You viewed the Karachi weather already it may help,only adjustments needed for summer and winter . I lost many many vandas all types some deceased ones are in my photo gallery! Please let me know,how I can grow Vandas? The topic of this thread is Catasetum Alliance growing. Please let's stay on topic. If you have questions about growing Vandas, please first read the Vanda Culture Notes thread in the Orchid Care Cultivation section or read the Vanda culture sheet found at AOS | Members Only Area. If after reading those you still have questions, please feel free to post them in the appropriate section. I just found some sticky stuff on my Catasetum's that have little white spots. grrrrr. Wiped off the leaves with a botanical cloth then sprayed with Bayer 5 in1 and the cinnamin/soap mix. I hope this takes care of them. I don't know how I missed this thread, but what a lot of great info. I got one of Jay's after dark's and while the growth is a bit small it has 4 roots so far with 3 of them being about 2" long now. Jay sent it in hydroton, so I am keeping it growing in it and just started to water. I think I need to give it more sun from what you are saying, Renee, so will have to find a better spot that will give it the light it needs. Hopefully I will have success. Leathal, were they definitely bugs? I know these kinds can put out a lot of nectar when growing well, which sometimes drys up into white crystallized spots as well. synda, good luck with yours! I had started an experiment this year, I put many of my Cycs and Mormodes into S/H. Well, only three took to it, I'm about to move the rest back into traditional potting, and hope to save them. Also, I snapped a pic this morning of different spikes, showing female and male buds in Catasetum hybrids. In the pic, the spike in the upper left are female, I can tell because of the development of the creases. The other two spikes are male flowers and will not develop those creases. Last edited by rcb; 05-30-2010 at 10:37 AM. Also, I snapped a pic this morning of different spikes, showing female and male buds in Catasetum hybrids. In the pic, the spike in the upper right are female, I can tell because of the development of the creases. The other two spikes are male flowers and will not develop those creases. ok, if you saw webs, then probably was bugs - maybe mites? Regular insecticides won't work on mites remember. although oils and alcohol will. And yes, mine will put out nectar on the growing shoots, not just the flower stem. Once the leaves unfold and start getting big, they don't seem to produce nectar, but the lower part - what is the developing p'bulb do. As for bloom time - oh no Catasetums can bloom almost any time. It's the Mormodes and Clowesias that typically bloom with no leaves. Cycnoches usually still have leaves during bloom also. The nectar was also on the leaves. I didn't know until I was inspecting. I just seen the little white spots on the bulb, then when I touched it, that is when I noticed the sticky stuff. The cloth I used had neem oil. Hi everyone, since here in the northern hemisphere it is prime growing season for this alliance, I thought I'd give an update on my plants and how they are doing this year. The majority of them are growing so fast, you can see a difference almost daily. They are beyond just growing leaves now, and the beginnings of a p'bulb can be seen developing. My early season bloomers have mostly bloomed, and so far only one this year has bloomed female. One plant is even putting out it's third spike this year. That's the good news, here's the bad news. My experiment with S/H absolutely did not work. As I know others are successful with this method in this alliance, I'm sure it's not the method, but somehow they way I implemented it. Of the 20 or so plants I tried, only three took to it. Most I caught before they completely went kaput, and moved them into traditional potting. About 5 were too far gone and died, unfortunately two were my only plants of Cyc. Martha Clarke. So will have to get a couple more of them someday. But my experiment with using CHC in clear pots as compared to using spaghnum moss in hanging baskets seems to be going well. Root development looks good, and the new growths themselves are very robust. Hope yours are doing well also. Thanks for the update Renee! I am sorry you lost so many in s/h. The 3 that you gave me are in s/h, and they are going gangbusters. I will have to post a pic. They are awesome to watch, growing so fast. I would love to know why yours did not work in s/h. Do you think the catasetums you gave me are old enough to bloom this year? Sarah, I'm not sure, I think at least one of them should be big enough. Hope it does. One of mine is getting a couple leaves with yellow. I have them in th morning, East sun. Been getting a lot of rain lately, can they get too much water? leathal - I've never rotted out roots for these, but mine do dry out a little overnight. So basically I don't know. By yellow is it a lowest leaf, or possibly heat/sun? I do know mine right now are very light green. Also remember these kinds need a good bit of fertilizer as they are growing so fast. Maybe increase your fertilizing schedule a little bit? Finally got a picture and it isn't pretty. I think bugs got to it.